Posted in Veggies/sides, on October 12th, 2009. I was totally prepared to be ho-hum about this dish. Until I took my first bite, that is. Then I ate every single solitary rice kernel on the plate. It makes a delicious side dish, or if you’re inspired to eat a meal without a meaty main dish, this is the answer. This isn’t vegetarian, because it does contain pancetta and chicken broth. I suppose you could leave those out, but am not sure it would be all that good. But then, vegetarians are used to eating some foods without the intense flavors provided by meat. So maybe it would be fine! Oh yes, it also contains a moderate amount of butter too. And the saffron – when Phillis Carey prepared it at the class, she meant to put in a pinch of saffron. When she dipped into it, though, her fingers grabbed a gob of it – probably more like 2-3 teaspoons. 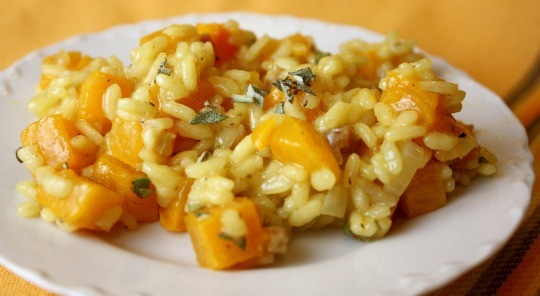 Not only did it color the risotto – that lovely rosy yellow gold that saffron does – but it also gave it HUGE flavor. So in the recipe below I increased the saffron. We had the leftovers a few nights later. Oh my goodness were they ever GOOD. Not quite as creamy, but almost. I could have just eaten THAT for dinner. 2. Toss squash cubes with olive oil and season with salt and pepper. Spread squash out on a parchment-lined (or Silpat) baking sheet and roast in oven for 25-30 minutes, tossing once, until very tender. Set aside. 3. In a saucepan bring the chicken broth and saffron to a simmer. 4. In a Dutch oven melt butter over medium heat. Add pancetta and shallots and cook for 10 minutes or until shallots are tender and pancetta cooked. Stir in arborio rice and toss with butter mixture. 5. Stir in white wine and cook for about 2 minutes, stirring constantly. Add 1/3 of the chicken broth mixture and cook, stirring often, until broth is almost absorbed. Continue cooking, adding ore broth as the rice absorbs it. Continue cooking until the rice is just about tender, about 30 minutes total time. Season with salt and pepper. 6. Stir in the sage and the roasted squash and heat it through, about 2-3 minutes. Remove from heat and stir in the butter and Parmesan cheese. Stir to combine well. Serve immediately. Per Serving: 441 Calories; 18g Fat (37.8% calories from fat); 12g Protein; 55g Carbohydrate; 2g Dietary Fiber; 38mg Cholesterol; 909mg Sodium.